REDMOND, OR -- Two aircraft emergencies occurred at two Central Oregon airports about an hour apart, Wednesday morning. 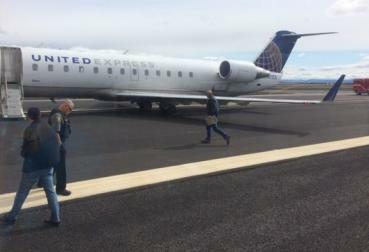 The first involved a United Express plane at the Redmond Airport. According to a passenger aboard the plane, the pilot said there was a malfunction in the landing system and the crew was forced to apply the emergency brakes. The plane was stopped on the ground by the time first responders arrived. There were 23 passengers on board and everyone deplaned safely; no injuries were reported. Airport Director Zach Bass says all four tires on the small plane were flat. In his years at Roberts Field, he says it's the first time he's seen that occur with a commercial aircraft. The plane remains disabled on the secondary runway until a mechanic and new tires can be flown in. Bass says it's not impacting airport operations. About an hour later, at around 10:45 a.m., a small plane flipped on to its top at the Sisters Eagle Airport. 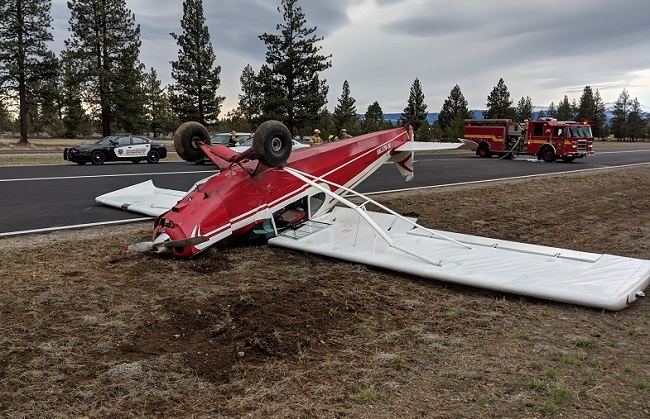 The Deschutes County Sheriff's Office reports the pilot and passenger were able to get out on their own and were not seriously hurt. A Black Butte Police Sergeant saw the single engine plane flip while attempting to land and radioed for assistance from the Sheriff's Office and Sisters Fire. Arriving crews found the plane just off the runway, on its top. The runway was closed for about 90 minutes for the investigation. The Sheriff's Office says the pilot, 73-year-old Brian Lansburgh, of Sisters, was attempting to land when a gust of wind caused the plane to flip. Lansburgh and his passenger, 88-year-old John Watson of Bend, were the only two aboard at the time of the incident.